From Warsaw to Minsk to Moscow. 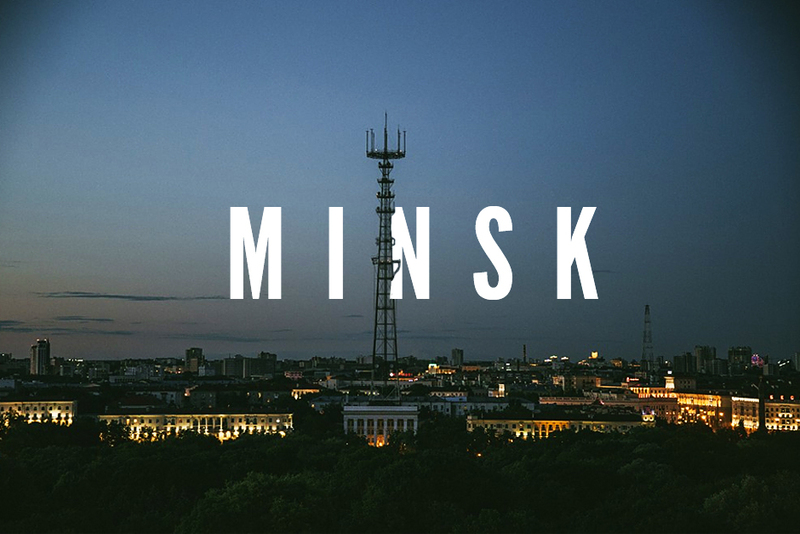 I left Warsaw for Minsk at 2am in the morning from an outlying station, not in the centre of the city. It was a pretty grim utilitarian place with no shops open at that time of night. The temperature had dropped quite a bit and it was lashing down rain. It made me a bit homesick for Dublin; really, well, just a little bit and just for a short while. I get a big kick out of experiencing new things so being on a windswept platform in a Stalinist railway station at 2 in the morning with nobody speaking English and announcements over the tannoy in Russian and Polish was very exciting. At my age, I’ll take excitement as it comes! Minsk was interesting not just for itself but both the journeys to and from it were also interesting. The journey was a short one, just 12hrs or so, but I still had a sleeper booked. I always prefer to be horizontal, when there’s an option. The train was a bit late, about 30mins or so. It was coming from Berlin and going to Moscow. When it arrived, I patiently joined the queue and waited my turn to board. It was about 2am now, cold and raining fairly heavily, a damp rain, as might say in Ireland, if people still say these things. The custom in boarding Russian trains, and this was an Russian Railways train, is to wait patiently in a queue while the carriage attendant scrutinises both ticket and passport. If the details on the ticket doesn’t match the details on the passport, no entry, no questions, no appeals. Every carriage has its own carriage attendant who must be obeyed and who can also make life pleasant, if you’re pleasant to them. All my paperwork was in order so I made my way to my carriage. The door was locked so I knocked. It opened and a woman peered blearily out. I tried to get into my berth but it was covered with luggage. Indeed, the whole carriage was covered in luggage. There was a lot of faffing and toing and froing in Russian and I hadn’t a clue what was going on. The woman was with her son and her mother and they were returning to Moscow from Berlin, hence the vast amount of luggage, I surmised. Naturally, she didn’t speak English and I don’t speak Russian but we managed to converse in German. The carriage attendant got involved and they all spoke at the same time in increasing volume. I could see the level of distress and decided not to be too controlling about it and not to insist on my ‘rights’. Roll with the resistance, I thought to myself, and go with the flow. I knew the border was coming up in a few hours anyway and that I was not likely to get a good night’s sleep anyway. The carriage attendant, very apologetically asked me if I would like to change to another carriage. Sure, no problem. The carriage was a 1st class on but not a sleeper. It had airline type reclining seats and there was only one other passenger in the whole carriage, a woman who was asleep. I stashed my bag and crashed out. A few hours later, the train shuddered to a halt and it was time for the border controls. First off, it was the Polish and they were very thorough going through paperwork, asking lots of questions and doing whatever they were doing. I initially thought they were Belarusian because they were armed and very paramilitary looking. This took about 60mins and then they all got off and the train slowly went through no-man’s land. It was like old movies about the Iron Curtain. The train stopped and whistled and shook for a bit and then went silent. Then the Byelorussian crew boarded and went through the same rigmarole. They were very stern and unsmiling; not to be messed with. They wore those amazing Russian military caps that look like you could launch a plane from them. One guy has a very Romanov looking beard and he seemed to be in charge. He looked like the sort of person I wouldn’t like to get on the wrong side of. Again, this took another hour and I was getting very tired by this time as dawn was coming and the sky was beginning to lighten. When they left and the train started off again, the other passenger and I started chatting. She was a Belarusian living in Amsterdam. She didn’t speak English but spoke Dutch so we could converse. She was going to visit her family in Minsk for the first time in 3 years since her husband suddenly dropped dead. As she spoke about her husband, she gave a shuddering convulsive snort of anguish and then apologised and stated that she estill felt very emotional about it. I could see how much she was distressed and tried to be as supportive as I could, given the context, and also not add to her burden of embarrassment, which seemed the dominant behaviour for her. I reflected how, in my family history, caring about what others thought about me was far more important than what I thought or indeed felt about myself. We chatted and drifted off to sleep and chatted again in that strange intimacy that emerges when people are disconnected from everyday life and temporarily enmeshed in a liminal bubble, such as a train journey. And then the train arrived at Minsk and we both went our separate ways; never to meet again. Maybe she mentioned the kindly Irishman she met on the train from Berlin to Minsk over a meal with her relations. I doubt she thinks that I’m writing this about her. Ships that pass in the night. 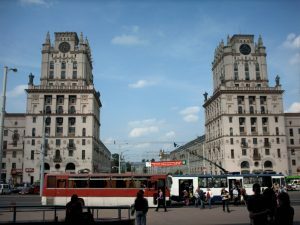 Minsk was my first non EU stop and my first time, this time around, in a hardline anti-western state so I wasn’t sure what to expect. I was pretty confident nevertheless that I’d be grand and that the people, like people everywhere, would be ok. It’s the people in uniform you have to worry about. I walked like I had a right to be there and that I owned the place. The journey from the arrival platform to the arrivals hall was through a grim darkish tunnel. Oh, Jaysus, this doesn’t encourage hope, I thought to myself. The station itself though, like all stations in ex-soviet countries, was palatial and a little self-sufficient town in its own right almost with everything I needed. Everything was grand. It was now about 9 in the morning and I was feeling a bit tired and disconnected because I hadn’t really slept the night before. My check-in time wasn’t until 2pm so I had a few hours to kill. I dropped off my main bag at the station cloakroom; it only cost about 30¢ to do so. They even allowed me to pay in €uro as I had no Belarus money and gave me change in roubles. It was just a 5€ note so I had to find a cash machine to get some spending money and here’s where my first major cockup occurred. Foreign exchange and money changing can be a terrible pain in the arse as well as being expensive. Buying on the black market has a much better rate than the official rate frequ but you’re never sure whether the notes are counterfeit or not. This happened me once in Lao a few years ago. Being a good Catholic boy, I’m aware of both sins of commission and omission so when I was planning the journey I thought about the things I could do to eliminate ate as ucht stress and hassle as possible. The Internet makes everything so much easier so I wondered if there would be a way to use a prepaid card so get cash instead of carrying cash with me. I used one a few years previously in Thailand but it was clunky to use and a bit of a hassle to top up. I asked my new bestest friend, Gary Google, and came across an app based mastercard currency card linked to my Irish bank account where everything was done via a brilliantly designed app. It’s called Revolut. There are no commission, topup or withdrawal charges and you get the interbank rate on exchanges, better than the best bureau de change. Cash withdrawal are free for first 400€ per month and then 2% after that, I think. Best of all, all the security details are done via app so card can be instantly disabled or magnetic strip disabled or several other features disabled. This really sold it for me as security would be important on my journey. I got one about 6 months or so ago and use it now as my main bank card. It costs about 5€ to buy the card, postage costs only as the card is free and there are no transaction charges. There is an option to upgrade to a premium card with a whole load of extra benefits and this costs 95€ a year. I went for this option because it offered a free spare card and also the option to have a new card couriered to anywhere in the world within a few day in an emergency. And this is the reason for the last sentence of the last paragraph. I found an ATM in the station and decided to take out enough money to last me the day or so I would spend in Minsk. I could only get a 48hr transit visa and was informed that no hotel would allow me to stay if I overran my visa. I thought I would only need about 40€ to withdrew in Belarus roubles. So, that is what I did. And then I went off and left the card in the machine. Feck, feck, feck. I only discover this a few hours later when buying coffee and immediately disabled the card by the app on my phone. I found a WiFi signal at a McDonalds; they’re everywhere. I ordered another card to be sent to Moscow and started using my spare card after I enabled it by app. Neat trick, eh? Of course, it would have been neater to have not forgotten the feckin’ thing in the first place. As this was very unusual behaviour for me; I never lose things; I decided to go to my accommodation and ask for early check-in. I recognised I was tired and time HALT. When I eventually found it, I was introduced to the Russian ‘mini-hotel’ This is an apartment or group of apartments in an apartment block where the owner has turned it into an hotel. They are usually studio apartments or separate bedrooms with shared kitchen and bathroom facilities. When I finally found the landlady in her apartment at the back of a rather magnificent example of Soviet public housing (see photo. I was in LH building). Using Google translate app: sez she. Shite. What will I do now, I’m really knackered and need to get my head down, I sez to myself. But not a problem, sez she, my cousin has apartment nearby and you can have for same price. I had booked through bookings.com. Keep your wits about you now, boyo, this might be a scam, I thought. The apartment was about 2 minutes away and on the 4th floor and was magnificent. See HERE for video clip . It even had a washing machine so I could wash me socks and smalls, a bit minging by now. So, a result! 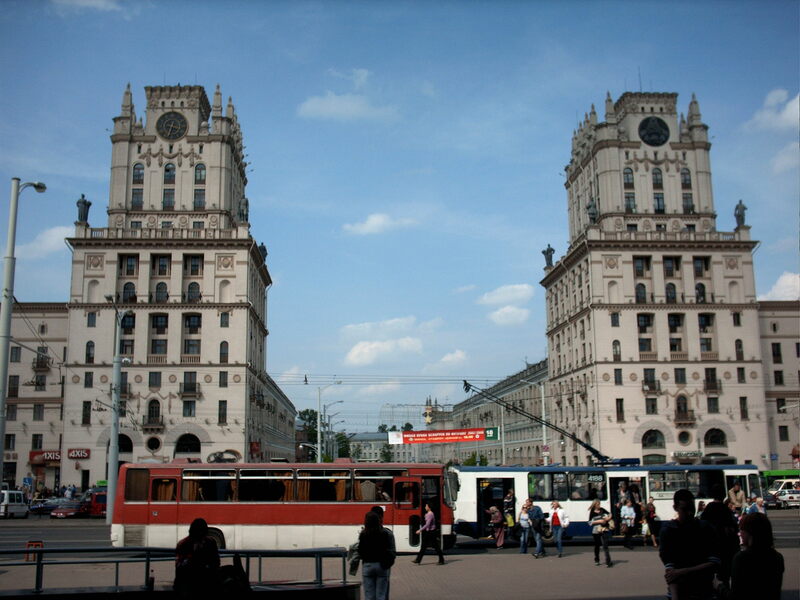 I had a shower but by now was wide awake so went out to explore Minsk by tram. 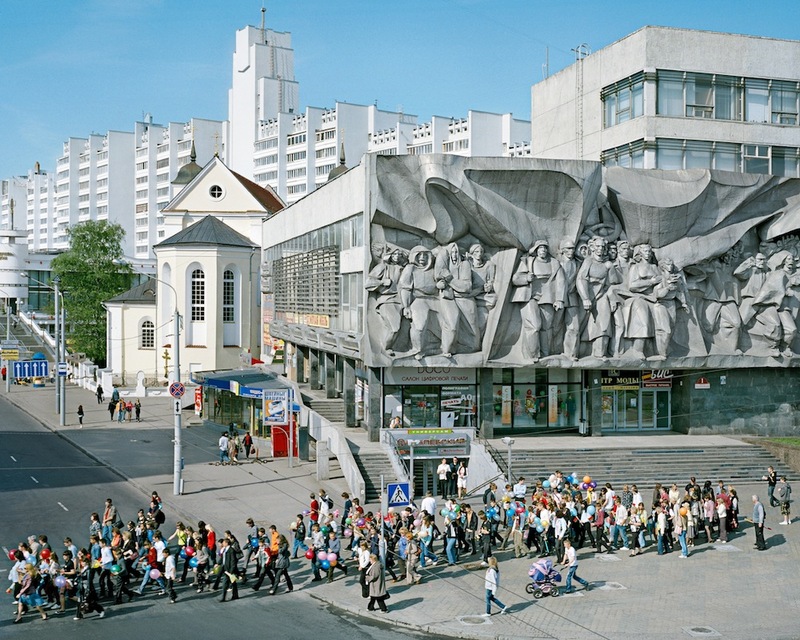 Minsk is very much a planned city with wide boulevards and the buildings were not too high. I read somewhere that the height of the buildings is the same as the width of the avenues. This symmetry is very pleasing to look at. I won’t witter on about the city as I was only there long enough to get a fleeting impression. One thought I took away though was that communism was not all bad and I wonder how it might have turned out had the counter-revolution and foreign interference and ensuing civil war not taken place. But they did, and also the Great Patriotic War with the nazis where millions died. Stalin and the terror came from all this. We’ll never know, sadly for the past and future. The train to Moscow was leaving at 9:45pm to arrive in Moscow the next morning at 7am. A short hop really. 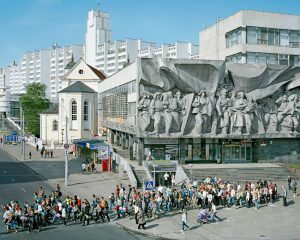 I didn’t expect to get much of a sleep as I was anticipating a repeat of the Polish border rigmarole with both Belarus and Russian immigration taking hours to check paperwork and engage in institutional paranoia. But, not a bit of it. I hadn’t known it at the time but Belarus is effectively part of Russia so the border check at Polish border was carried out by Russian immigration so we just sailed through the night to arrive in Moscow next morning bright eyed and bushy tailed. I had booked a lower berth in a 2nd class carriage so there were 2 lower and 2 upper berths. It’s just pot luck who your travelling companions are but I was lucky this time. There was only 1 other passenger in the compartment and his name was Yuri who was an accountant in a multinational firm going to Moscow for a business conferences with some colleagues, who were in other compartments. He spoke very good English and was an agreeable travelling companion. Shortly after the train started, several of Yuri’s colleagues crowded into the compartment and brought bags of food and drink. They all spoke English and were very welcoming and friendly to the extent that they spoke English amongst themselves so as not to exclude me. I was moved and humbled by this act of generosity and kindness to a stranger and couldn’t but wonder what would the situation be like if the tables were reversed and they were in Ireland. 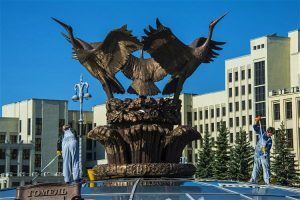 Then they went back to their compartments and I slept like a log until about 6:30 the next morning and we arrived in Moscow..
That’s it. My time in Belarus. More about Russia later. Feel free to comment so I don’t feel like I’m talking into a vacuum.